Pain; Migraine; Headache; Health-Related Quality Of Life.. Objectives: To determine the benefits of wet cupping on pain and health-related quality of life (HRQOL) in adult patients with migraine headaches. Methods: We conducted a prospective observational study of wet cupping in 128 patients referred to the cupping clinic at King Abdulaziz University Hospital, Jeddah, Saudi Arabia between January 2013 and December 2015. Bloodletting was performed at the base of the head and between the shoulders monthly four times. We assessed migraine headache pain using the visual analog scale (VAS) and the quality of life of patients before and after each cupping session using the World Health Organization Quality of Life assessment instrument. Results: The mean age of the patients was 40.5±11.3 years with a preponderance of females (n = 114, 89.1%). VAS was averaged at 7 before the procedure and reduced to 3 after wet cupping, both during rest and activity (p ≤ 0.005). Ninety-five patients agreed to complete the quality of life questionnaire. There was a significant improvement in the quality of life after wet cupping treatment in most of the displayed items (p < 0.050). None of the patients reported post-procedure complications. Conclusions: Wet cupping might be considered a complementary treatment for migraine headache pain relief and improvement to a patient’s quality of life. We sought to determine the beneficial effect of wet cupping on migraine headache patients, particularly any improvements in pain and HRQOL. This prospective observational clinical trial was conducted at King Abdulaziz University Hospital, Jeddah, Saudi Arabia, from 2013 to 2015. Following the principles of Helsinki Declaration and after the ethics and research committee approval (Reference no. 851-12), informed written consent was obtained from all adult patients suffering from migraine headache for six months or longer, diagnosed by an expert pain specialist and referred to the cupping clinic for an alternative and complementary therapy trial. Pregnant or lactating women, patients with mental or psychological illnesses, patients using opioids or psychotropic medications, patients with local infection at the site of cupping, cancer patients, and patients complaining of other acute or chronic pain conditions were excluded from the study. Data were collected by a nursing assistant interviewing the patient on each visit using a well-structured questionnaire. The questionnaire contained two parts. The first part dealt with demographic, anthropometric data, and any medical conditions, while the second part involved the assessment of HRQOL using the World Health Organization Quality of Life assessment instrument (WHOQOL-BREF).17 Translation was conducted for all non-English speaking patients. Data were collected before cupping, one week after the treatment, and repeated at each session immediately before and after the treatment. Any complications as a result of the cupping procedure were documented. Migraine is often accompanied by medical, neurologic, or psychiatric disorders that have a negative impact on a patient’s HRQOL. We used the WHOQOL-BREF questionnaire to measure HRQOL. The questionnaire was modified to include 17 questions covering four domains: physical health, psychological health, social relationships, and environment. The internal consistency of the four domains was assessed and ranged from 0.66 to 0.80. The content validity, construct validity, and the reliability of the WHOQOL-BREF questionnaire has been assessed previously in many studies and was acceptable.18,19 We limited our questionnaire to 17 questions out of a possible 26 to obtain a full idea about the patient’s HRQOL in a reasonable time without any delay. We used an 11-point visual analog scale (VAS) to assess pain with 0 meaning no pain and 10 meaning the worst pain imaginable. Baseline values were obtained before the procedure, both with the patient at rest and during activity, and repeated after each session monthly for four consecutive months. Cupping was performed by an expert therapist using sterile disposable plastic cups, placed at the root of the head bilaterally and between the shoulder blades. Plastic cups were applied to bloodletting points and suction was activated, then sterilization of skin was performed, and slight skin laceration was performed using a sterile 22-gauge surgical lancet. Bleeding from the dermal microcirculation was initiated by reapplying the plastic cups on the skin scarification points to encourage bloodletting. After 5–10 minutes, the blood in the cup became solid, the cup with the blood was removed, the skin was cleaned with alcohol and covered with gauze for 24 hours. 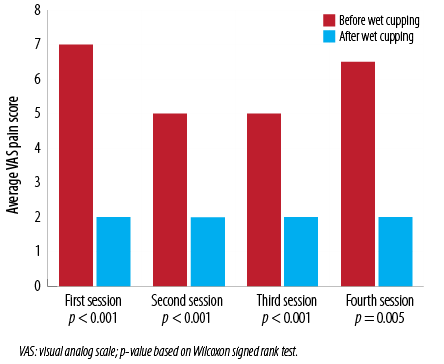 Knowing that research on wet cupping is limited, a pilot study was conducted to estimate the sample size. Considering 80% as an acceptable power to determine differences in VAS pain score with 95% confidence interval (significant p-value < 0.050), a sample size of 47 patients was calculated to detect the differences in VAS. All data analysis was performed using SPSS Statistics (IBM Corp. Released 2013. IBM SPSS Statistics for Windows, Version 22.0. Armonk, NY: IBM Corp). Participant demographics were analyzed using descriptive statistics. The Wilcoxon signed rank test was used to analyze pain scores as these are ordinal variables and the readings are paired (i.e., each patient has two readings, one before and one after the cupping procedure). Figure 1: Changes in pain score at rest after wet cupping between successive sessions. Figure 2: Changes in pain score with activity after wet cupping between successive sessions. A total of 128 patients suffering from migraine headache were included in the study. The mean age of the patients was 40.5±11.3 years with preponderance of females (n = 114, 89.1%) over males (n = 14, 10.9%). Most of the enrolled participants had an elementary level of education (44.7%), whereas 27.0% had higher degrees of education. Most patients (70.4%) were housewives, 12.8% were single, 78.7% were married, 8.5% were divorced/widowed, and 12.5% were smokers. All patients were exposed to wet cupping on the first session. Their VAS was averaged at 7 before the procedure and was significantly reduced to 3 after. Eighty-six patients underwent a second session where their VAS pain score dropped from 6 to 2; 54 had the procedure a third time, and their average VAS pain score decreased from 5.5 to 1. Only 17 patients had a fourth session, and their VAS pain score decreased for 5.5 to 2. All changes in the VAS score at rest were statistically significant [Figure 1]. The same finding was observed in the VAS score during activity [Figure 2]. Table 1: Mean scores of patients’ responses to items reflecting their quality of life before and after wet cupping treatment. *Based on paired sample t-test. Ninety-five patients agreed to complete the questionnaire. Table 1 shows that there was a significant improvement in HRQOL after wet cupping in most of the displayed items. The overall self-rating of the patients for the quality of their life HRQOL after wet cupping was 3.9±0.7 compared to 3.4±0.9 before. A similar response was found for “being satisfied with life”, “have more energy for everyday life”, “more satisfied with sleep”, “more satisfied with their capacity to work”, “have enough energy for everyday life activity”, and “satisfactory personal relationships”. Meanwhile, patients indicated that they had less pain to prevent them from doing what they needed to do and decreased episodes of negative feelings such as blue mood, despair, anxiety, and depression. Although there was an improvement in the remaining items displayed scores, they were not statistically significant (p > 0.050). None of the patients reported post-procedure complications such as local infection, significant bleeding, hematoma, or disfiguring scar. Repeat cupping sessions are associated with a progressive reduction in pain scores.22 In patients with tension headache, repeated cupping sessions are more effective than one-time cupping.23 The relation between repeat wet cupping and progressive reduction in pain was established in all studies,22,23 but the exact mechanism of pain reduction with repeated cupping is still unclear, and further studies are needed to determine this and to investigate the shorter duration of pain relief. The observational design of our study is one of its limitations. Others are the short follow-up period and the limited number of cupping sessions with a high drop-out rate. Also, we did not use a well-validated Arabic language migraine-specific assessment tool to assess quality of life. Additionally, the preponderance of females over males may affect the generalizability of this study. Further studies are needed to improve knowledge about cupping and its use as a therapeutic modality. Wet cupping might be considered an alternative treatment therapy for migraine headache as it reduces pain and improves patients’ quality of life without exposing the patients to major complications. The authors declared no conflicts of interest. This work was financially supported by Yousef Abdul Latif Jameel, Scientific Chair of Prophetic Medical Applications, Faculty of Medicine, King Abdulaziz University, Jeddah, Saudi Arabia. 1. Tepper SJ, Dahlöf CG, Dowson A, Newman L, Mansbach H, Jones M, et al. Prevalence and diagnosis of migraine in patients consulting their physician with a complaint of headache: data from the Landmark Study. Headache 2004 Oct;44(9):856-864. 2. Koehler PJ, van de Wiel TW. Aretaeus on migraine and headache. J Hist Neurosci 2001 Dec;10(3):253-261. 3. Tulen JH, Stronks DL, Bussmann JB, Pepplinkhuizen L, Passchier J. Towards an objective quantitative assessment of daily functioning in migraine: a feasibility study. Pain 2000 May;86(1-2):139-149. 4. Bigal ME, Fernandes LC, Moraes FA, Bordini CA, Speciali JG. [Migraine prevalence and impact in employees of the clinical hospital of the medical school of Ribeirão Preto-USP]. Arq Neuropsiquiatr 2000 Jun;58(2B):431-436. 5. Bigal ME, Lipton RB. The epidemiology, burden, and comorbidities of migraine. Neurol Clin 2009 May;27(2):321-334. 6. Mason VL, Skevington SM, Osborn M. The quality of life of people in chronic pain: developing a pain and discomfort module for use with the WHOQOL. Psychol Health 2008;23(2):135-154. 7. McLean A, Coutts K, Becker WJ. Pacing as a treatment modality in migraine and tension-type headache. Disabil Rehabil 2012;34(7):611-618. 8. Raggi A, Leonardi M, Bussone G, D’Amico D. A 3-month analysis of disability, quality of life, and disease course in patients with migraine. Headache 2013 Feb;53(2):297-309. 9. Gharehbaghian A, Mehran M, Karimi GH. Hijama through the passage of time. Sci J Iran Blood Transfus Organ 2009;6(2):147-158. 10. Lee MS, Kim JI, Ernst E. Is cupping an effective treatment? An overview of systematic reviews. J Acupunct Meridian Stud 2011 Mar;4(1):1-4. 11. Ullah K, Younis A, Wali M. An investigation into the effect of cupping therapy as a treatment for anterior knee pain and its potential role in health promotion. Inter J Alter Med 2007;4(1). 12. Chirali IZ. Traditional Chinese Medicine Cupping Therapy. Second Edition. Philadelphia: Churchill Livingstone, 2007. ISBN 13-978-0-443-102-660. 13. Yoo SS, Tausk F. Cupping: East meets West. Int J Dermatol 2004 Sep;43(9):664-665. 14. Kim JI, Lee MS, Lee DH, Boddy K, Ernst E. Cupping for treating pain: a systematic review. Evid Based Complement Alternat Med 2011;2011:467014. 15. Kwon YD, Cho HJ. Systematic review of cupping including bloodletting therapy for musculoskeletal diseases in Korea. Korean J Oriental Physiology & Pathology 2007;21(3):789-793. 16. Cao H, Zhu C, Liu J. Wet cupping therapy for treatment of herpes zoster: a systematic review of randomized controlled trials. Altern Ther Health Med 2010 Nov-Dec;16(6):48-54. 17. Barcaccia B, Esposito G, Matarese M, Bertolaso M, Elvira M, De Marinis MG. Defining quality of life: a wild-goose chase? Eur J Psychol 2013;9(1):185-203. 18. Trompenaars FJ, Masthoff ED, Van Heck GL, Hodiamont PP, De Vries J. Content validity, construct validity, and reliability of the WHOQOL-Bref in a population of Dutch adult psychiatric outpatients. Qual Life Res 2005 Feb;14(1):151-160. 19. Skevington SM, Lotfy M, O’Connell KA; WHOQOL Group. The World Health Organization’s WHOQOL-BREF quality of life assessment: psychometric properties and results of the international field trial. A report from the WHOQOL group. Qual Life Res 2004 Mar;13(2):299-310. 20. Gharebagiyan A. Cupping over time. Blood Journal. The scientific journal of Iranian blood transfusion organization (Khoon) 2009;6(2):2009.147-158. 21. Huber R, Emerich M, Braeunig M. Cupping - is it reproducible? Experiments about factors determining the vacuum. Complement Ther Med 2011 Apr;19(2):78-83. 22. Tabatabaee A, Zarei M, Javadi SA, Mohammadpour A, Bidaki AA. 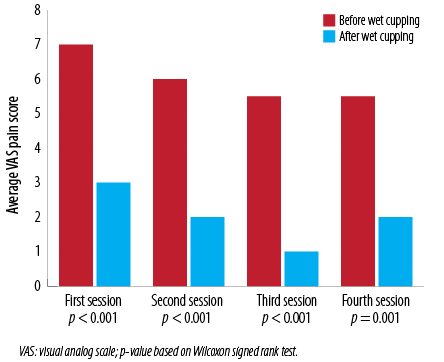 The effects of wet-cupping on intensity of headache in migraine sufferers. Jundishapur Journal of Chronic Disease Care 2014;3(2):1-12. 23. Ahmadi A, Schwebel DC, Rezaei M. The efficacy of wet-cupping in the treatment of tension and migraine headache. Am J Chin Med 2008;36(1):37-44. 24. Firoozabadi MD, Navabzadeh M, Roudsari MK, Zahmatkash M. Comparative efficacy trial of cupping and serkangabin versus conventional therapy of migraine headaches: A randomized, open-label, comparative efficacy trial. J Res Med Sci 2014 Dec;19(12):1134-1139. 25. Tabatabaee A, Zarei M, Mohammadpour A. Comparing the effect of wet-cupping and temperament reform on the severity of migraine headaches. Quarterly of the Horizon of Medical Sciences 2014;20(1):43-48. 26. Sohn D, Yoon H, Jung H. The effects of dry cupping therapy on shoulder pain and fatigue in nurses. Pharmacopuncture 2011;14(2):25-35 . 27. Buse DC, Rupnow MF, Lipton RB. Assessing and managing all aspects of migraine: migraine attacks, migraine-related functional impairment, common comorbidities, and quality of life. Mayo Clin Proc 2009 May;84(5):422-435. 28. Buse DC, Silberstein SD, Manack AN, Papapetropoulos S, Lipton RB. Psychiatric comorbidities of episodic and chronic migraine. J Neurol 2013 Aug;260(8):1960-1969. 29. Messali A, Sanderson JC, Blumenfeld AM, Goadsby PJ, Buse DC, Varon SF, et al. Direct and indirect costs of chronic and episodic migraine in the United States: a web-based survey. Headache 2016 Feb;56(2):306-322. 30. Osterhaus JT, Townsend RJ, Gandek B, Ware JE Jr. Measuring the functional status and well-being of patients with migraine headache. Headache 1994 Jun;34(6):337-343. 31. Stewart WF, Lipton RB, Kolodner KB, Sawyer J, Lee C, Liberman JN. Validity of the Migraine Disability Assessment (MIDAS) score in comparison to a diary-based measure in a population sample of migraine sufferers. Pain 2000 Oct;88(1):41-52. 32. Solomon GD. Evolution of the measurement of quality of life in migraine. Neurology 1997 Mar;48(3)(Suppl 3):S10-S15. 33. Dahlöf CG, Solomon GD. The burden of migraine to the individual sufferer: a review. Eur J Neurol 1998 Nov;5(6):525-533. 34. Peters M, Abu-Saad HH, Vydelingum V, Dowson A, Murphy M. Migraine and chronic daily headache management: a qualitative study of patients’ perceptions. Scand J Caring Sci 2004 Sep;18(3):294-303. 35. Cottrell CK, Drew JB, Waller SE, Holroyd KA, Brose JA, O’Donnell FJ. Perceptions and needs of patients with migraine: a focus group study. J Fam Pract 2002 Feb;51(2):142-147. 36. Lauche R, Cramer H, Langhorst J, Dobos G. Cupping for chronic nonspecific neck pain: a 2-year follow-up. Forsch Komplementmed 2013;20(5):328-333. 37. Lauche R, Cramer H, Hohmann C, Choi KE, Rampp T, Saha FJ, et al. The effect of traditional cupping on pain and mechanical thresholds in patients with chronic nonspecific neck pain: a randomised controlled pilot study. Evid Based Complement Alternat Med 2012;2012:429718. 38. Al Jaouni SK, El-Fiky EA, Mourad SA, Ibrahim NK, Kaki AM, Rohaiem SM, et al. The effect of wet cupping on quality of life of adult patients with chronic medical conditions in King Abdulaziz University Hospital. Saudi Med J 2017 Jan;38(1):53-62.